A significant percentage of well-cared for pet birds will ultimately die of cancer. The reason being is that they are living longer and cancer occurs more frequently in older birds. Some of the reasons for the longevity include: Protection from the dangers of climatic extremes and predation, appropriate diets, regular health checks, preventative and prophylactic treatments . Pet birds are living average life spans many times more than their wild counterparts and often much longer than pet birds a decade ago. This contrasts significantly with “wild” free roaming birds that have significantly shorter lifespans. As an example we saw 2 cockatiels over 20 years old and a budgerigar over 15 years old last week. Why do our pets get cancer? Almost every diagnosis of cancer at our bird clinic is followed by the same question by the owner ... why? There are many reasons and we don’t understand them all. We and our companion pets were created with an “immune surveillance” mechanism whereby damaged cells anywhere in the body are recognized by the body’s blood cells as foreign and destroyed. During our lives single “cancer” cells are often formed, from toxins, UV radiation etc – but they are removed before they can multiply and establish. If the cancer cells can evade the immune system cancer may develop. What is cancer in birds? Cancer is an accumulation of cells derived from a single transformed cell, whose growth and replication occurs out of control. Cancer cells usually continue to grow after the stimulus that caused them is removed. Benign is a term used to define slow growing cancers whose cell types are not far removed from the original cell type, and the mass remains in the site of origin. Malignant cancers grow rapidly and extend beyond their site of origin. The fact that we are cancer free most of our life is a wonder in it self. Some of the common cancers that we see in domesticated birds at our Melbourne veterinary avian practice include spindle cell tumours of the connective tissues; carcinomas of the kidneys and reproductive systems; lipomas (in fat birds) and lymphoid tumours in pet chickens. Fortunately many of our clients are very bonded to the pet birds and observant of any early changes as our chances of success in treating cancers improve if caught at an early stage of the disease. 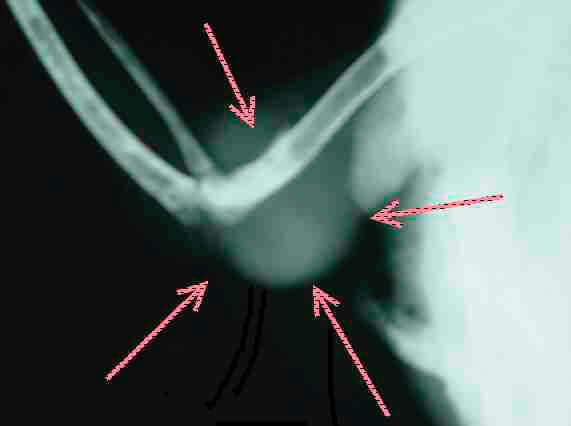 A typical case seen at Bird Vet Melbourne was Billie, an 18 year old Sulphur Crested Cockatoo with a lump on his elbow extending towards the shoulder. The lump was firm and growing rapidly. We started off our investigations with less painful, non invasive diagnostic procedures. Step 1: Fine Needle Aspirate. This involved putting a very thin insulin needle into the lump and getting a few cells that we could examine under the microscope. This was done in house and the results were available within a few minutes. The result in Billie’s case: malignant spindle cells, with no infection present. Step 2: We took radiographs of the wing and at the same time the whole bird to determine the extent and spread of the tumour. Step 3: Under general anaesthesia with preoperative pain relief and drip fluids we surgically removed the wing. Care was taken to keep the patient warm, keep the anaesthetic time short and to minimize blood loss. Sterile surgery – note the see-through sterile drapes, the patient connected to anaesthetic via an endotracheal tube, there is very little blood loss, the wing to be amputated is wrapped in a sterile bandage. Treatment involved amputation of the wing at the shoulder as we knew that the tumour was malignant. Billie had not been flying anyway due to the growth damaging the wing. Pet birds appear to cope well with wing amputations and the recovery is rapid. They seem to manage well afterwards even though they cannot fly. Step 4: We sent the affected mass to a pathologist that has an interest in birds. The lump was analysed so that we knew the type of tumour, the likelihood of it reoccurring and also if the lump was completely removed. The tumor was a fibrosarcoma which occurs in older birds in the cockatoo group. The pathologist commented that spread to other organs was unlikely but that it could return near the original surgical site. Other treatment that could have been considered were radiation therapy and cancer drugs injected into the tumour but with amputation of the wing these were not considered necessary. The goal for cancer treatment in birds is a little different from that expected in man. We aim for complete cure but balance the choice therapy, in consultation with the owner, with a wish for minimal side effects and good quality of life post treatment. Rapid recovery from cancer treatment is important in the veterinary perspective. Human cancer patients may be more willing to accept side effects of relatively toxic levels of drugs hoping for a complete resolution.